This is an oil portrait of Reepicheep which I did several years ago. (Incidentally, this is NOT Despereaux.) I have prints and greeting cards of this painting available for purchase in my SHOP and on ETSY. One would look great in a child's room or even in a playfully-pompous library or den. It would also make a great gift for a fan of the books or movies. If I tried to summarize Reepicheep's character or key passages including him from the books, I would do him and Lewis an injustice. So, let me just say, you NEED to read the books (which are excellent over all), if only to meet this little-BIG guy. You can purchase the books and the two films they have done so far on Amazon through these links... (The films are okay as movies go, but they don't compare to the books - read the books!). 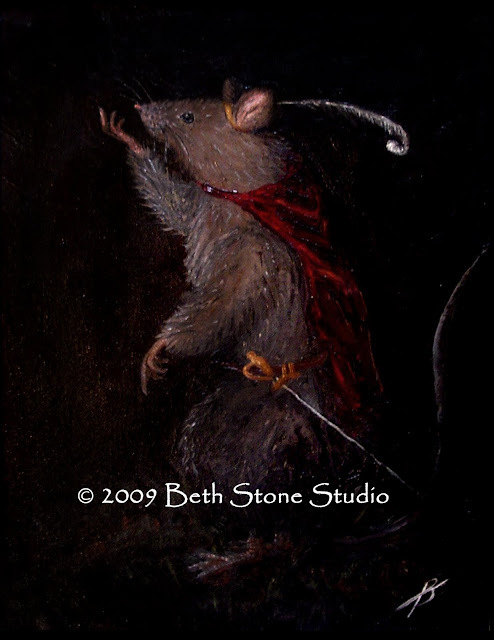 (Reepicheep appears in Prince Caspian, The Voyage of the Dawn Treader, and The Last Battle). If you shop through my links here, I earn credit through Amazon's Associates Program... So thanks for shopping! This piece has remained one of my most popular works of art. In fact, Reepicheep has been so popular amongst my friends and family that I have painted 4 other versions of this painting. One of these paintings, a gift to my Dad, was stolen out of the frame from one of his exam rooms in his pediatrics office. So if you see a small version of this painting with my signature hanging in someone's home or office and they are not one of my relatives or close friends, it is stolen property, and you should contact the authorities (or me). So, I suppose I have joined in the ranks of the likes of Vincent Van Gogh, who has had his paintings stolen too. The only difference would be that his other paintings sell for millions and mine for gobs slightly less than that. And I'm hoping not to starve to death or go crazy. And I have no immediate plans to cut off either of my ears..... At any rate, it's a little bit flattering to have had something I painted stolen - that means at least they LIKED it - but I feel violated too..... rather like being whistled at. So there's my story. Wow! I really am sorry that you feel violated about your painting being stolen, but its still pretty cool. Now that I think about it....AT your dad's office, really? Can you imagine some parent rolling it up and hiding it in their diaper bag.